I was alerted about MobileScrobbler in a Twitter post by Wayne Sutton tonight. Ever since the day I got my iPhone, I felt like the always-on data connection could be put to some great music logging use. I’ve been using Last.fm to track my music listening habits for almost three years now, but whenever I leave the house my music goes unmonitored. I thought, could someone write an application to monitor music played on the iPhone and then report it to Last.fm with Edge or Wifi? This is exactly what Sam Steele has done with MobileScrobbler. In my initial testing (just a few songs so far) the application reports songs instantly over both Wifi and Edge. The app will even work great for Touch users, as it currently stores 250 songs in the submission queue, so your play counts will be updated whenever you get to an open Wifi connection. I don’t know if Last.fm tracking software exists for other media-centric phones, PalmOS, Windows Mobile, or Symbian systems. If not, I hope MobileScrobbler encourages the development of some. I love the fact that now my Last.fm profile is going to be so much more representational of what I’m listening to while away from home. Unfortunately, though, it’s another reason to leave my 60gig iPod at home and instead carry an 8gig sub-set of my music library. 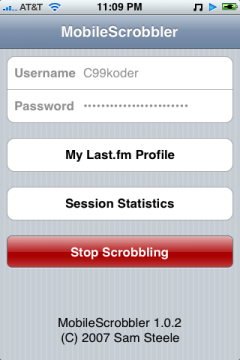 Audioscrobbler has the ability to log music listened to on your iPod using ‘Recently Played’, but it never works for me… must be something about how I mix computer listening and iPod listening time before syncing.